I absolutely loved my Lip Sphere: I loved the smell, the flavour and the quirkiness of the packaging. And then, one day a few months ago, I *sniff* lost it. I'm still adoring the packaging, and it's nice to have it in a different colour. I really wish I knew where my old one was, because I can imagine they'd look so cute (did I really just use the words "so cute" together?) next to each other. It's really difficult to know what to say about a product that I've already reviewed, but I do have to say that I'm not really loving this one quite as much as the previous one. 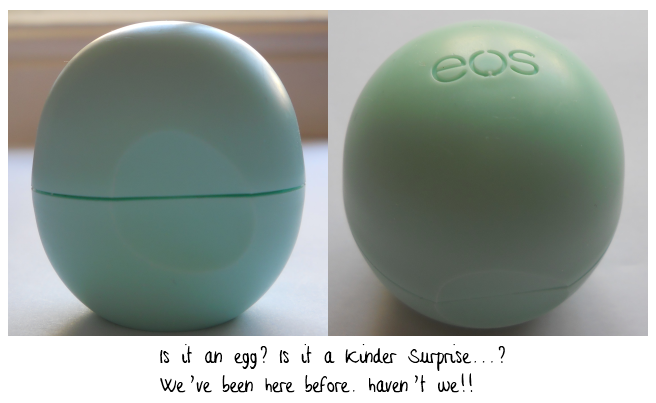 When I first opened my original lip sphere, the smell just blew me away, in fact the other half's words had been "yummy", and wearing it had been like a little piece of Heaven (yes, I know how corny that sounds) because it lasted for ages on my lips, smelt gorgeous and tasted delicious (what? it did taste good!). But, I'm not really feeling that with this one. To be fair, I'm not a huge fan of mint-flavoured lip products. However, I'd opted to give this one a go, because I'd remembered how subtle the flavour of the Summer Fruits one had been, but in comparison, I personally found this one to be just too overpowering for me, and if I apply too much it tastes a little sickly too. I'm not a huge fan of this product. I still love the packaging, and I love that it's all natural ingredients wise, but the flavour and scent just really put me off. I'm still intending to use it, because heck I'm not wasting my money, but unfortunately, it probably won't be the go-to product that the Summer Fruits one was. So yes, a little disappointing. But, just as a quick disclaimer, if you honestly LOVE minty products, then really do give this product a try, because I'm convinced that you will love it!! However, if you're not particularly a fan, it's perhaps best not to chance it on the possibility that you might. You can pick this up from Ebay, or the Naturally Fabulous website for £4.75 each. The Strawberry Sorbet and Passion Fruit Duo, which both sound yummy are £9.25. Have you tried the Eos Lip Spheres? Or, which flavour do you really want to try? I purchased a 3 pack of EOS lip balms from eBay last year, my favourite out of the lot has to be the Honeysuckle Honeydew one, nom nom! I really need to try that one don't I :D I want to try them all though haha!! I really like this product! I am enjoy the smell,taste,longevity and smooth lips. I haven't tried the other yet,but look forward to it. I live in Virginia,US my husband made the purchase at a local gorcery store.